Cold Weather Makeover: Getting Your Home Ready for Changing Seasons | Puck Realty, Inc.
Winter is in the air, leaves are falling and nights are getting cooler. Not only is this football season and time for sweaters, but it also is a good time to get prepared with your home for colder temperatures and winter weather. Here are some steps you can take to cold weather proof your home, be prepared and remain safe. Now is a good time to check your insulation and make sure all is in good shape. Check your walls, attic, basement, windows and doorways to ensure that air is not leaking in and your heat escaping. This will also help you be more energy efficient in your home as you turn on the heat to warm up. Make sure your heating system and hot water heater is in good shape. Time can slip away over the spring and summer. Make sure that as you prepare to use your heat for the cooler seasons that all is running well and in good shape. Have your home checked if ventilation is not properly working or pipes seem to not be working right. It is good to be prepared before temperatures get too cold or freezing weather hits your pipes. Keep your pipes and gutters clean. 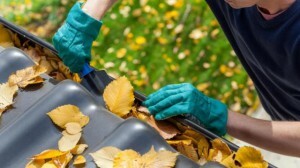 With falling leaves and debris, it is easy to let your gutters and outside pipes get clogged up. Keep them open so that any moisture and rain fall can drain properly from the outside of your home. This helps prevent roof damage as well as water damage to your home. Have your roof checked for weak spots, cracks or damage. Before freezing temperatures come, be sure to have your roof checked for any areas that need repairs. It is better to have these places identified and fixed before temperatures fall in case of piled up leaves or falling, frozen branches that can pierce weak areas and weigh them down. Cold weather means bundles of hot chocolate and holiday fun, but be sure your home is prepared along with you and your family to ensure that you all stay safe, comfortable and warm. If you need help winterizing your home or preparing it for sale; give our Puck Realty team a call at 919-842-5900.